The security of electronic communications has been hampered by too many standards and deployment options, making email, instant messaging (IM), and other web-based methods prime targets for hackers. 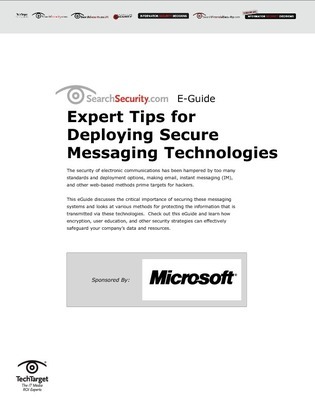 This eGuide discusses the critical importance of securing these messaging systems and looks at various methods for protecting the information that is transmitted via these technologies. Check out this eGuide and learn how encryption, user education, and other security strategies can effectively safeguard your company's data and resources.